Canadian public and corporate defined benefit plans improved their solvency in 2017, achieving a medium 97% funded status, research from Mercer Canada shows. 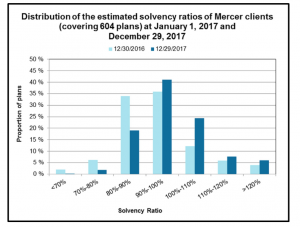 Covering 604 Canadian plans, Mercer’s pension health index shows that while the December 29 solvency ratio remained unchanged from September 30 at 106% funded at the end of the fourth quarter, the ratio was up 4% from the beginning of 2017. According to a news release, funded status spiked due to strong equity markets, with the biggest gains in Q4. However, some gains were weakened by long-term interest rates, which fell 30 basis points in the quarter. US equities returned 6.6% in US-dollar terms and 6.8% in Canadian-dollar terms, while international equities returned 3.7% in local currency and 4.5% in Canadian dollars. Emerging market equities returned 5.7% in local currency and 7.7% Canadian. Mercer reports the higher Canadian-dollar returns resulted from the currency’s Q4 depreciation against the US dollar, British pound, and euro. “Canadian DB pension plans are better funded now than they have been for most of the past decade,” Manuel Monteiro, leader of Mercer Canada’s Financial Strategy Group, said in a statement. In light of the new funding rules released in December, Monteiro also encouraged all plan sponsors to review their risk management strategy. The rules, projected to significantly reduce the volatility of contributions sponsors need to make to their respective plans, will also reduce the level of contributions for most plans. However, some plans may face slightly higher contributions. “Many sponsors of closed and frozen plans will likely continue reducing risk with an ultimate goal of eliminating their defined benefit liabilities. However, other pension plan sponsors will view the new rules as an opportunity to continue to take risk in the expectation of reducing the long-term cost of their pension plan,” Monteiro said.